The Mediterranean big-boat racing season winds down with Les Voiles de Saint-Tropez finishing up this weekend, and what a photo finish it was! After Friday's racing was cancelled due to high winds, Saturday began with lacklustre conditions – no wind and sloppy seas from the previous day's storms – leaving sailors wondering if they would get to race at all. But by mid-day, wind conditions had improved a race was to be had. It proved an energetic competition as yachts in each class sought to raise their ranking as much as they could on the last day. 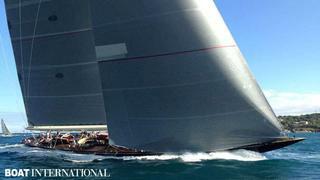 The regatta sees stunning classics and the top modern racing yachts out on the racecourses off St Tropez. Moonbeam IV took first place in the classic Grand Tradition Class, and naval architect German Frers sailed his father's 1935 Bermudian cutter Sonny to a win in the Epoque Marconi C Class. The regatta set the stage for a show-down between class yachts, with the J Class beauties and the modern Wally racing machines battling it out in their own divisions. Four J Class yachts competed, Hanuman, Lionheart, Shamrock and Velsheda, taking turns in the lead over the week. Saturday's racing started out with Velsheda and Hanuman tied in points, in fact. Hanuman led Velsheda on the first mark, but sail failures took away the potential lead. 'Our A2 split, then the lock broke on the Code Zero, and whilst we gathered back the sails on the decks we went from having a one minute advantage to two minutes behind - with Velsheda sailing so well at the moment it basically cost us the race and the regatta,' says Hanuman's helmsman Kenny Read. The day finished with Velsheda taking the win. For the Wallys, all eyes were on the WallyCento yachts Hamilton and the newly launched Magic Carpet3, which were battling it out in the new WallyCento Box Rule for the first time in St Tropez. In the end, Magic Carpet3 bested her sister, taking third place overall in the Wally Class, just ahead of Hamilton in fourth, while Open Season led the class and J One came in second. In the modern large-yacht IRC A Class, Boat International had the pleasure of racing aboard the recently launched Tempus Fugit, which took a joint fifth place in the class along with Whisper. It was an exciting finish for the first Tempus 90 wooden-built yacht, which raced against predominantly carbon racers and racer cruisers in the 23-strong modern class. The F-Class Firefly finished third place in the class, while the green-hulled Vitters yacht Inoui was a speedster on the course but came in 10th on corrected time.